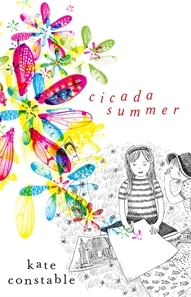 Cicada Summer by Kate Constable falls into my ‘Best Book Ever’ category. It is about a girl called Eloise, who never speaks, and her dad, who are both moving to the country, near where Eloise’s grandma lives. Before going to see her grandma, they stop at an old house her dad wants to turn into something else. Eloise walks into the house and suddenly hears a girl a bit younger than her calling, “I’m coming!” Then this little girl runs down the stairs and at the sight of her Eloise runs out of the house. This is where the story really begins. After staying at her grandma’s for a while, Eloise finally goes back to the creepy old house again on her bike. She notices a summerhouse and walks in with her eyes shut. Some cicadas that were singing suddenly stop, and Eloise opens her eyes in confusion. She’s in another time, in another place. She soon meets Anna, who looked just like the girl in the creepy house. But when Eloise meets her, she is confused. Two years ago her mother died, and her name was Anna. Because of this, Eloise thinks she has gone back in time. But when her dad finds his new girlfriend Lorelei Swan, everything that can go wrong does go wrong. Can Eloise fix everything? Will she ever talk again and find out what was really happening with the summerhouse? I reckon this book is quite amazing and everyone should have a go at reading it. The questions above are what kept me going. I loved the mystery and the intrigue of the book and just couldn’t put it down until I had finished! The language is fairly easy, and I bet you’ll fall in love with it by the first sentence. This is Jemivieve’s first book review for Alphabet Soup (thanks, Jemivieve!). If YOU would like to send us a book review, check out our submission guidelines. Happy reading! Cicada Summer is a brilliant book, isn’t it?